Have you seen a mermaid in Santa Cruz? If so, you might have just spotted local fashion designer Areli Pina embracing her inner mermaid. But she's not alone! 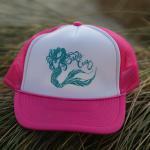 Her line of mermaid-themed apparel and accessories has taken Santa Cruz in waves. Areli Pina studied fashion design at the Academy of Couture Art in Beverly Hills, and the Fashion Institute of Design & Merchandising.